Although several studies have described the prognostic implication of bone marrow (BM) involvement (BMI) in lymphoma, studies focused on BM-involved diffuse large B-cell lymphoma (DLBCL) are very rare and small-sized. This study was performed to examine the prognostic impact of morphologic findings of BMI by lymphoma and risk factors for central nervous system (CNS) relapse in BM-involved DLBCL. 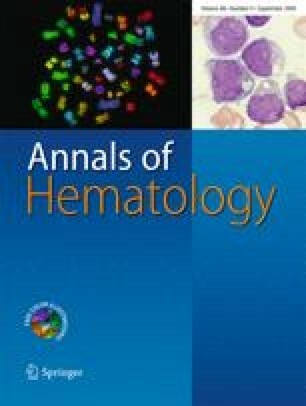 Between 1993 and 2005, 675 patients were diagnosed with DLBCL, and 88 patients who had BMI at initial diagnosis were eligible for this study. The median overall survival (OS) and failure-free survival (FFS) of 88 patients were 36.6 and 20.1 months, respectively. When three variables from BM morphologic findings (the pattern of BM infiltration, extent of BMI by lymphoma, and percentage of large cells in the infiltrate) were simultaneously included into multivariate model, the increased extent of BMI by lymphoma (≥10%) in BM area was the only negative prognostic factor, independent of the International Prognostic Index (IPI). Patients with both lower IPI scores and less extent of BMI showed an excellent prognosis with chemotherapy alone (5-year OS and FFS rates, 80% and 69%). However, morphologic BM features were not independent predictive factors for CNS recurrences. An increased lactate dehydrogenase (LDH) level at initial diagnosis was the only independent predictive factor for CNS relapse. Further efforts should be directed toward finding optimal treatment modalities based on the IPI and the extent of BMI by lymphoma. CNS prophylaxis may be considered only in patients with initial elevated LDH levels. K.-W. Lee and J. Yi equally contributed to this study. We are grateful to Seo-Kyung Hahn of Medical Research Collaborating Center Seoul National University Hospital for her statistical assistance in the revision of this manuscript. This study was partially supported by a grant from the Innovative Research Institute for Cell Therapy, Republic of Korea (A062260).